Stacy Wykle is a graduate student in the School of Information at The University of Texas at Austin, where she is completing a certificate of advanced study in “Science, Information, and Cultural Heritage.” As part of her class “Rare Books and Special Collections” with instructor Michael Laird, Wykle studied the Ransom Center’s copy of Institutions de physique, by Émilie de Breteuil, marquise du Châtelet (1740), an item from the Desmond Flower collection of Voltaire. 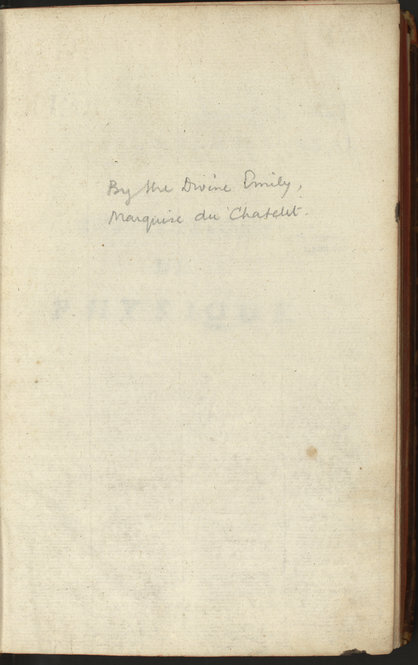 One item in the Ransom Center’s Desmond Flower collection of Voltaire is a work by the woman who is most often credited as having been Voltaire’s lover. It is far more fitting, however, that she be known for authoring the first French translation and commentary of Isaac Newton’s Principia, a work that is still considered to be the standard translation in France. Over the last decade, interest in the life of Enlightenment intellectual Gabrielle Émilie Le Tonnelier de Breteuil, marquise du Châtelet (1706–1749) has flowered. In addition to two biographies that have been written over the last few years, Mme. 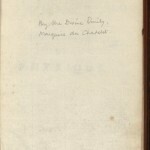 du Châtelet has been the subject of two plays and an opera—Legacy of Light by Karen Zacarías, Emilie: La Marquise Du Châtelet Defends Her Life Tonight by Lauren Gunderson, and Émilie by Kaija Saariaho. She is currently of great interest to public libraries and archives in France. 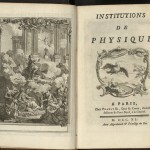 Just last year the Archives de France and the Bibliothèque Nationale de France appealed to the French public for donations to assist in preempting the sale of the manuscripts of Émilie du Châtelet and Voltaire that were sold at auction in Paris by Christie’s. Rather than merely being Voltaire’s lover, du Châtelet exemplifies the style of argumentation that accelerated the separation of science and philosophy during the Enlightenment. 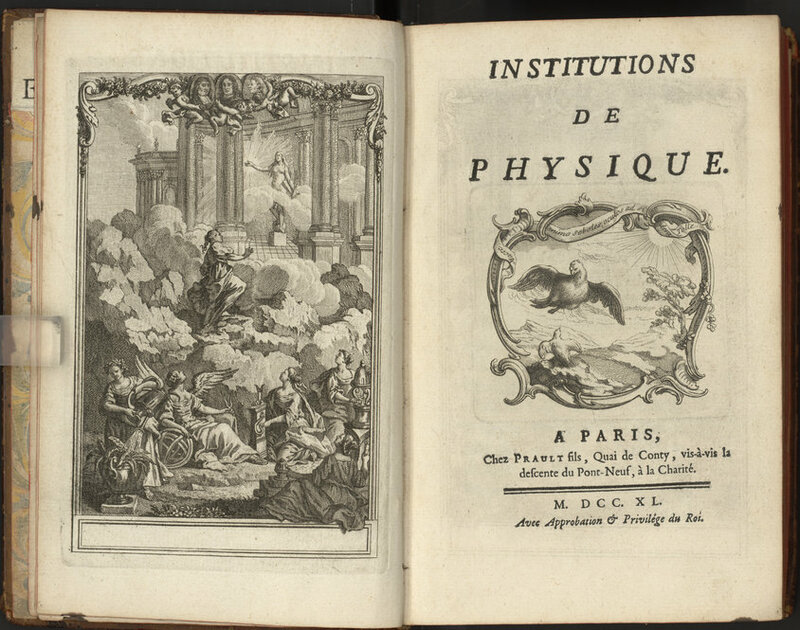 Although her famed translation of Newton’s Principia was published after her death, du Châtelet’s Institutions de physique is a rich example of the philosophical hybrid of the eigtheenth century that produced modern science. 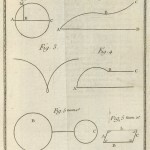 Published in 1740, her Institutions shows the influence of Descartes and logical premises from Leibniz that continued to govern scientific inquiry into the twentieth century, and illustrates the ways in which French thinkers challenged and corrected some of Newton’s mechanical theories. It can be argued that her contributions to the development of modern science far outshine those of her more famous consort. This item is part of the Desmond Flower collection of Voltaire because of the author’s significant relationship with Voltaire. 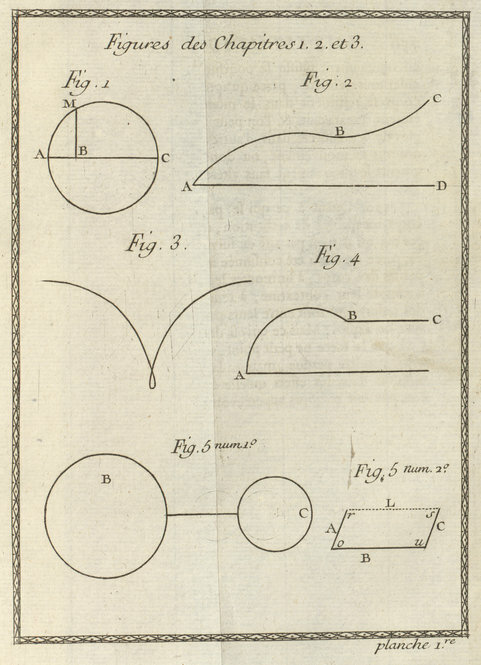 Yet the work could stand on its own as an important contribution to the history of science and to the spread of the commonplace understanding of Newtonian physics. Title page and engraving from the Ransom Center’s copy of “Institutions de physique,” by Émilie de Breteuil, marquise du Châtelet (1740), an item from the Desmond Flower collection of Voltaire.